Qigong is Chinese Health Exercise. These beautiful, gentle movements are designed to balance the energy in the internal organs, releasing old, ‘negative’ “Qi (energy) and gathering fresh healthy Qi to store in the body. We are born with a certain amount of ‘ancestral’ Qi which our parents pass on to us, like a seed that needs to be nurtured and cultivated in order to grow strong and healthy to realize its potential. By developing our Qi, the practice of Qigong provides the best environment for us to develop our health, thus avoiding illness and strengthening weaknesses we may have inherited: like soil, sunshine and water for our seed. ‘Wild Goose’ or ‘Dayan’ is the style of Qigong. 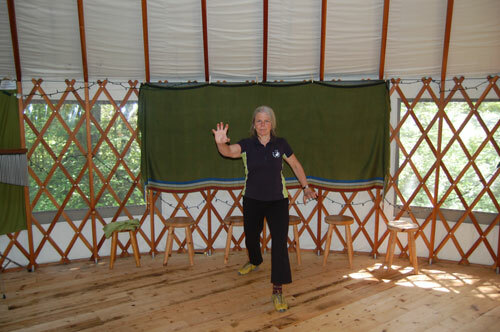 There are many styles of qigong developed and passed down through families in a sacred way. 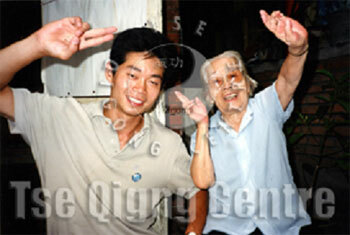 Our Qigong Master Michael Tse’s teacher (or ‘Sifu’) was a woman named Yang Meijun. She was the 27th generation inheritor of this high-level skill and was taught by her grandfather and she lived to be 104 years old! Wild Goose Qigong is a Daoist form which originated 1800 years ago in the Kunlun Mountains in the Western part of China. The monks, who were keen to strengthen themselves in the harsh conditions, observed how the Wild Geese were strong and healthy birds, so connected with Nature, migrating with the seasons and taking turns leading their formations to help conserve their energy. They are known for their longevity and loyalty. You can see that we imitate their strong and graceful movements in our Wild Goose forms, stretching, fluttering, swooping and bending. These gentle movements help our body to release toxins, improve immunity and increase energy levels. They can also help heal our stiff joints, aching back, arthritis and sleepless nights. We come together in the class and first we do a warm-up, to prepare our bodies. We then go through a series of Qigong movements which we all do together, everyone following along, seniors and beginners. You will then see everyone practicing on their own, working on different movements. The curriculum entails several different series of exercises to develop a strong grounding in the principles of Qigong. The first is Balancing Gong and then Healthy Living Gong. This is the first series we learn. It was created by Master Michael Tse, based on the Wild Goose principles. This helps beginners to develop the right posture, relaxation and breathing to allow the Qi to flow throughout our bodies. It involves an introduction to some basic acupuncture points and ways of shifting our weight to gain the maximum benefit from the movements. This series of eleven exercises, is very important and, even when we have learned many of the advanced forms, we still practice Balancing Gong regularly, understanding and deepening into it more and more. It is good for flexibility, circulation and balance and helps with back and shoulder pain and arthritis. Also created by Michael Tse, these exercises include influences from the Wild Goose Qigong as well as the martial arts that he has mastered: Chen Style Taiji, Wing Chun Kung Fu and Chun Yuen Quan. The movements in Part I focus on relaxation, Part II on co-ordination and fitness and Part III on physical strength and power. With a strong basis in the above series, we then move on to the beautiful Wild Goose movements which flow together to create a form. The first 64 movements help us to best benefit from the Qi we gather from breathing, eating, drinking and sleeping, as well as dredging out the energy channels in the body, letting go of old, stale Qi or illnesses we have developed since birth. The second 64 movements work on the weaknesses we have inherited from our parents. We always end the class and our practice with meditation. We come to a place of stillness and store the Qi that we have gathered during the movements. When we have gathered and stored lots of Qi, it builds and rises up and so we cultivate our spiritual nature.